Chinese and Indian armies kicked off joint anti-terrorism military drills from October 11 to 23 in Kunming, capital of southwest China’s Yunnan Province. Chinese Defense Ministry spokesperson Wu Qian said last week the training is part of an annual exchange program between the two countries’ armed forces. 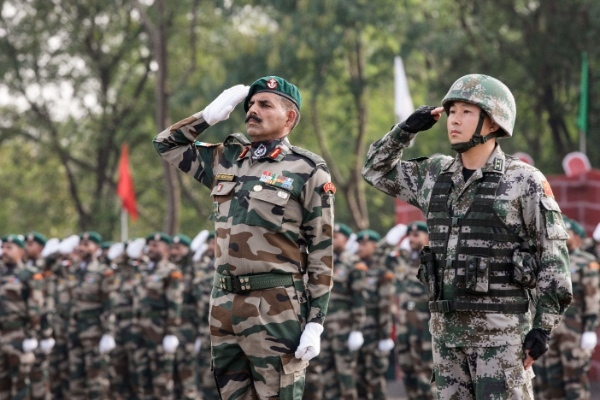 144 personnel from southwest China’s Chengdu Military Command joined an equal number of Indian counterparts for the drill, code-named “Hand-in-Hand 2015,” Wu said. The training will be the fifth of its kind between the two countries’ armies, the Chinese spokesperson added. The first was held in southwest China’s Yunnan Province in 2007, followed by drills in Belgaum, India in 2008, southwest China’s Sichuan in 2013, and in the western Indian city of Pune in 2014. The 2015 drills are divided three phases: armament display and military demonstration, troop training and integrated exercises. Zhou Xiaozhou, deputy commander of the People’s Liberation Army Chengdu Military Area Command, said on Monday “the exercise aims to improve China-India military communication and enhance mutual trust”. “It does not target a third party and is not related to regional events,” according to Zhou. Japanese, Indian and American navies are holding naval exercise in the Bay of Bengal from Wednesday. The US has reasserted its seriousness about the Asia Pivot policy announced by the Obama administration in 2009. Although, recent unraveling of its plans in Syria could overshadow its planned engagement in the Asian region. Meanwhile, China’s state-run Global Times said on Monday, “as members of the BRICS countries, both Beijing and New Delhi should boost their cooperation while improving themselves, in order to jointly create an Asian century, make breakthroughs in the current financial order, and forge a new global economic order that is more in line with emerging markets’ interests”. The influential daily criticized western media for fanning hostilities between the two countries. “Western media tend to view these issues with colored glasses, and therefore often misread the accidental confrontations on the borders,” said an editorial on Monday. China has recently lauded Indian support during its World War II conflict with Japan. Chinese envoy Le Yucheng said in New Delhi in August that India helped China defeat “fascist Japan”. “The Chinese people will not forget that as military allies, Chinese and Indian armies fought shoulder to shoulder against the Fascists, notably in the theater in Myanmar and the Indian army was instrumental in inflicting the most serious land defeat suffered by Japan in the war,” he said. Indian Finance Minister Arun Jaitley has also referred to the burgeoning trade and investment ties between India and China. “India-China trade has increased significantly. Trade has brought the two countries much closer… We have some contentious issues of the past between us, but even while those issues would be resolved in the due course, I think our economic relations have become a symbol of strength and therefore mutual investments in each other’s country will be a win-win situation for both of us,” Jaitley said. New Delhi and Beijing have set a target to reach $100 billion in bilateral trade by 2015. “China had been a significant contributor to the global growth in the past decade,” the Indian Finance Minister said last month. “Great economies do compete with each other and that does not mean they become opponents,” he said while facing media questions on the ‘rivalry’ between the two neighbours. BRICS members China, India and Russia are also the three largest shareholders in the China-led Asian Infrastructure Investment Bank (AIIB), with a voting share of 26.06 per cent, 7.5 per cent and 5.92 per cent, respectively.